Hurricane Sandy made landfall on October 29, 2012 and damaged or destroyed many communities along Staten Island, Long Island and the New Jersey shore. 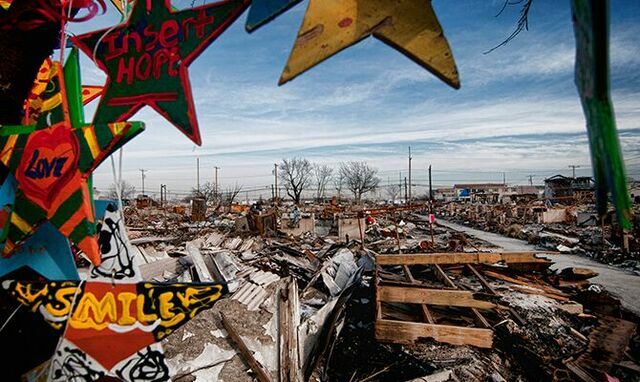 Thousands of people and hundreds of neighborhoods were left with homes, businesses, livelihoods, and spirit destroyed in its’ wake. The New York Says Thank You Foundation and Stars of HOPE volunteers began the process of bringing back hope to those communities who had lost everything. 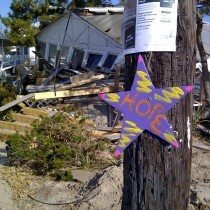 Stars of HOPE started to appear in the devastated communities almost as soon as the hurricane left the area. An estimated 15,000 beautiful Stars of HOPE can be throughout Manhattan, Gerritson Beach, Brooklyn, Queens, Broad Channel, Howard Beach, West Hamilton Beach, Long Beach, East Rockaway, Rockaway Park, Far Rockaway, Island Park, Massapequa, Belle Harbor, Coney Island, Breezy Point, Babylon, Oceanside, and Staten Island The commitment is to continue this process as long as they can inspire hope, love and a sense of “you are not alone” to the communities hardest hit by the hurricane. Five years later Stars of HOPE are still hanging on streets to give hope to communities.